Help ensure data control, integrity and transparency across your entire organization with ENAVATE's Global Data Management (GDM). Does your organization find it challenging to strike a balance between the needs of local subsidiaries and the need to have central control over consistent data? 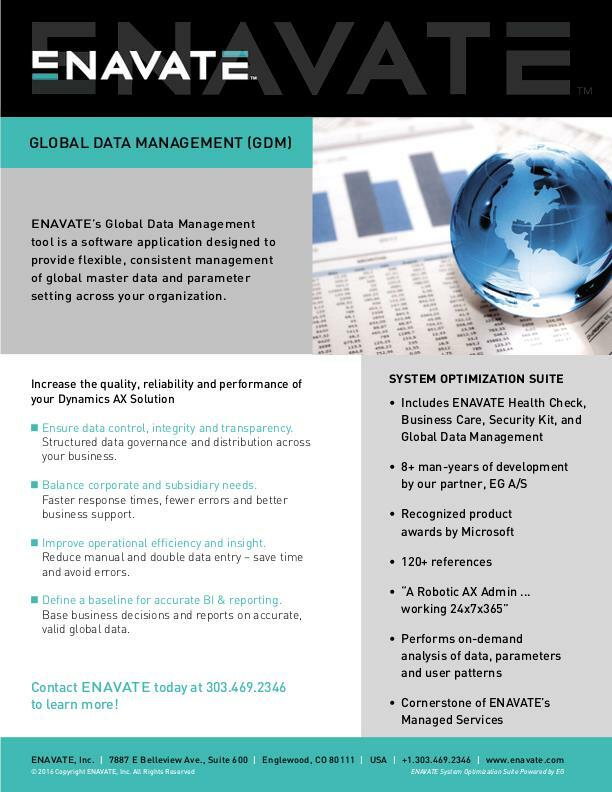 ENAVATE's Global Data Management (GDM) for Dynamics AX helps ensure transparency and consistency when working with business data across your organization, while still allowing for the requirements of individual companies. So you have the visibility, control and flexibility you need to be agile - without sacrificing data integrity. A one-company approach to global data management. Managing data in a uniform way across your entire organization has many potential benefits. It can improve operational efficiency and business insight. But when you have local subsidiaries or locations with unique requirements, it can be difficult to control and use data in a uniform and efficient way. With GDM, you can take a one-company approach to your data governance. The generic interface allows you to replicate data from one company to a number of companies in your Dynamics AX installation. You can determine centrally which information, settings, values and fields can be defined by local companies and which cannot, so you stay in full control. In this way, you can help ensure the consistency and validity of both global and local data and define a baseline for accurate reporting. This, in turn, paves the way for more efficient processes and better-informed business decisions. GDM is simple and straightforward to set up and use, and it enables control and flexibility when working with data across your entire organization. GDM allows you to determine what type of data each company in your organization has access to, and what they can do with it. For example, GDM can be set up so local manufacturing companies only get production-related data and local sales companies only receive sales-related items. You can also take local requirements, such as currency codes, VAT setup and payment and delivery terms, into consideration by allowing these to be defined locally. Global data can be pushed to subsidiaries either immediately as it is updated, manually when needed, or via batch jobs during off hours to optimize system performance. With GDM, you have full control over how and when data is distributed and to what degree it can be changed, deleted and updated by local subsidiaries. So you can meet local requirements while still running an efficient global organization. Flexible, consistent management of global master data and parameter settings across your organization.